At a conference high tea, a participant said, “It is scientifically proven that boys have monthly mood swings.” When probed about the source of this fact, he mentioned Google. Google, as a search engine, is accepted as the most reliable source of information, requiring no proof of credibility. Furthermore, words like “scientifically proven” or “scientifically established” make a fact trustworthy. Perhaps as a researcher, protocol stresses on a sound research methodology; and establishing any fact or knowledge base needs to be well substantiated by a research design. Two widely used paradigms (or world-views) that shape approaches to research and intellectual enquiry are positivism and interpretivism (quantitative and qualitative, respectively). This does not mean that there aren’t other paradigms. Rather that these two are the most common that shape scientific enquiry. Positivist methodology postulates that there is an objective truth which needs to be uncovered through research. In order to do that, positivists use quantitative research methods to draw inferences regarding society. Positivists argue that the individual is shaped by the society. Structured questionnaires and surveys are some of the tools used since they are objectively quantifiable; they rely on official data or statistics. For instance, a positivist will try to assess climate change by looking at the hydro-meteorological data available regarding change in precipitation patterns or temperature. Interpretivists, on the contrary, believe in understanding the subjective experiences of people and their reality as they experience and live it. They do not believe in one objective truth. Instead they argue that there are multiple realities or truths depending on people’s experiences. Individuals are themselves responsible for structuring the world around them rather than simply being passive recipients of it. The interpretive methodology includes tools like unstructured interviews and participant observation, which are inherently qualitative in nature. Interpretive researchers focus on the social construction of experience. In contrast to the positivists’ approach, they try to understand peoples’ perceptions of climate change and how they experience or interpret it. This subjective experience would be different for different groups of people – men and women, young and old, and so on. As we contemplate the relevance of the different research paradigms, we find that every individual is inclined towards a paradigm that calms the curiosity between his reason and realism. Though scholars try to find glitches in the other, each has a different modus operandi for data collection, sampling, analysis and inferences. It would not be wise to look down upon any but appreciate the distinctiveness of both. We can draw parallels from research methodology in our daily lives. While planning a trip we book our tickets in advance, read travel blogs or talk to a family member or friend who has visited the location in the past. If we interpret this in terms of research methodology what we did was a literature review: some research questions were answered and new ones surfaced; we sampled from accounts (experience) of those we know and trust (‘key informants’); we analysed the data and took a call on how we structure our trip. In its simplest form, this is how research methodology affects us. It is possible to relate this with other aspects of our life. People toss with facts and findings very casually without realising how they unconsciously shape our lives. For instance, the fact – ‘men have monthly mood swings’ – may have been studied on 50 households or a college or a classroom of 20 students. One is also not aware of the paradigm on which this fact was established. How do we generalise this or determinately use it? This ignorance may misguide an individual who may willingly accept a ‘fact’ at face value without questioning its authenticity or validity. It is important to understand that methodology affects us at both the mass and individual levels. Loosely delivered facts and findings may shape narratives, which eventually take the shape of a discourse. Social media sites and mobile messaging applications are easy sources of such loose facts. It is important to understand how policies are sculpted through research. The state authorities play a major role in framing and implementing a policy. Often a policy is not backed by an apt research methodology. For instance, the government of Senegal (Sub-Saharan Africa) was seeking to implement a project for irrigation development. The project would be implemented jointly by the farmers and the state. The engineers, however, made a design that overlooked the social aspects of technology. They failed to take into account that a village is not a homogeneous unit; it is divided into clans and each clan has its own autonomous political belief. To understand the social dimensions of technology, it was important to study the design from a sociotechnical lens, as each clan had different membership rights and access to resources. Such infeasibility could have been avoided if the local organisational pattern and farming system were studied at an early stage either by the national agency or the donor. Several such examples can be easily located, urging the need for an apt research paradigm. The bus rapid transit system (BRTS) opened in Delhi in 2008. In 2004, the state government had appointed RITES, a public sector engineering consultancy company, and IIT Delhi to design a BRTS in 2004. The technical and conceptual advisory was allocated to the transport research and injury prevention programme (TRIPP) of IIT Delhi. Commuters, traffic police, guards on duty at the corridors and public transport drivers complained of poor implementation. Passengers had to scamper across the entire road, as there were no pedestrian crossings. The matter was also taken to court. 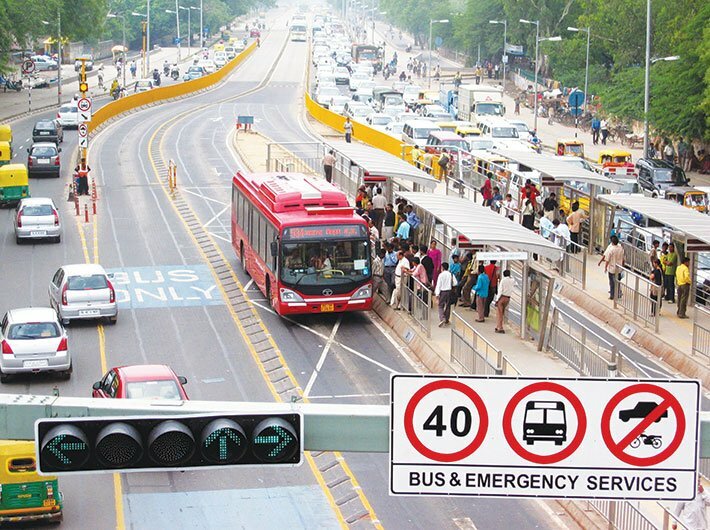 The BRTS attracted various criticisms like poor enforcement, difficulty accessing bus platforms and longer traffic signal cycle. In May 2012, the Central Road Research Institute (CRRI) conducted a feasibility study following the supreme court’s order. Interestingly, the study revealed that 70 percent of users were moving faster and there was a 32 percent increase in bus ridership. This contrast between the feasibility study and the public complaint is simply a difference of how the issue was assessed and evaluated (the research methodology!). Implementation is execution of what was researched (or planned) and if the experience of implementation is different from what was researched, it means that the research is not well grounded. The gap between the research and the execution may turn out to be counterproductive. Furthermore, the BRTS was replicated from Curitiba, Brazil. A project may turn out to be damaging, if replicated without being tailored to local contexts. Policy analysts widely use the concept of narrative to understand how policymakers make policy choices. A narrative is a story that represents some causality that policymakers repeatedly tell themselves and others to establish cause-effect relationships. Narratives are used to justify the policy choices made by policymakers. For instance, the narrative of population growth outstripping the food growth led to policy choices favouring the green revolution technology; ‘small family is a happy family’ became a narrative, lending support to policies for population stabilisation. A narrative influences the framing of the problem. Policy choices thus reflect the dominant narratives of their time. The paradigms that we operate with play an important role in shaping these narratives. A positivist researcher will present the problem differently than an interpretive researcher. For instance, while studying the management of common property resources such as village ponds, grazing lands and pastures, for a positivist, political scientists establish a relationship between rules and sustainability outcomes. They conclude that the ability to frame rules is an important factor shaping the sustainable use of resources. From an interpretivist view, legal anthropologists argue that individuals are confronted with different legal and normative systems and therefore attributing resource outcomes to one set of rules is problematic. This insight went a long way in understanding the failure of formal approaches at institutional design for managing such resources. A case is often made for linking research with policy. It is argued that sound public policy choices need to be based on research. It is assumed that good research will yield good policy. The issue is however more complex. The paradigms that researchers use and where they see themselves located influence the framing of the issue. This in turn influences what choices policymakers will make. As a result, choosing to milk an animal depends on whether we see it as a cow or an ox! Singh is a research associate at Management Development Institute (MDI), Gurugram. Narain is an associate professor, Public Policy and Governance, MDI.